One. Adele at iTunes Festival. I know I've mentioned Adele in a few of my Five Things I Love posts but she's just utterly gorgeous I can't help it. I watched her full set from the iTunes festival & it was just perfect. I had a little cry at Someone Like You, sometimes it just really gets me & when everyone was singing along - gah - it was just lovely. Most, if not all, of the songs are on YouTube now or I think you can still watch the whole set on iTunes for free. Honestly, it's beautiful & her cover of 'I can't make you love me' is a must watch! Two. 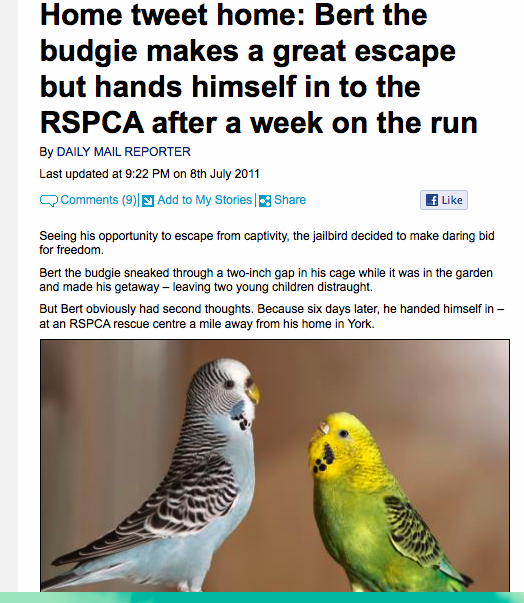 This super cute budgie story! This totally made me smile lots and lots & I'm super happy that those kids got their budgie back! I used to have 2 budgies when I was really small, the blue one was lovely but the yellow one was vicious and used to peck at people's hands! Ouchie! I've never been the biggest Topshop fan, I think it's very expensive and I generally don't find the quality to be super amazing to justify their price tags. Plus my local Topshop had some of the rudest members of staff ever - basically if you weren't a size 8 they'd stand and laugh at you for being fat - meanies! However, all that aside, I can't deny that they have some lovely items in at the moment. I just sadly don't have the pennies to purchase anything! Four. These Vivienne Westwood shoes! I'm pretty sure that I will never own a pair - I'm terrible at walking in heels and these are too lovely so I don't think I'd want to wear them and ruin them! The pink ones in the middle are my favourite & I love that they're all synthetic! Every so often a website comes along that just makes your heart smile & Dear Photograph does that for me. Ever since I heard about it through twitter I've been checking it daily & I often find myself getting a little teary at some of the entries. It's really really beautiful. 1. etc. 2. Selective Potential. 3. the flowerchild dwelling. 4. Hello Vanny. 5. here's looking at me kid. P.S. If anyone knows what kind of lashes look similar to the ones Adele wears please let me know! I'm going to get over my irrational fear of false lashes & I'd like ones that look full and lovely at the outer corners! Thank you! 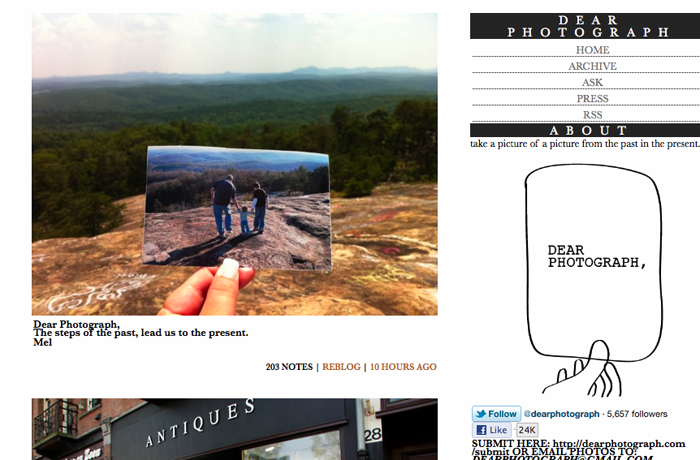 Aw I've never come across "Dear Photograph" before- what a lovely website. I'm welling up already and I'm only on the first page haha. I was watching adele at itunes on youtube just before i read your post! I've been trying to get tickets for months but she's completely sold out!! that budgie story is unbelievably cute! we had budgies when I was little, they were lovely and sang along to the eastenders song haha. I love topshop but those staff sound horrible; in little old hereford they're really nice and helpful, such a shame they're not like that near you. I quite agree about Topshop.I often like their stock, but I cannot understand how they justify their pricing, so I very rarely part with my money in there. I think you're just paying to own something from Topshop, if that makes sense. I always love your Five Things I love Friday - so many lovely things to look at! I feel the same about Topshop, but I have the same relationship with that shop as I do with Primark, which is that I won't buy anything for ages and then I'll go in and there'll be loads of things I like! I agree with you that they're overpriced. I have been lusting over those Vivienne Westwood/Melissa heels for a long time - I keep hoping a pair will pop up on EBay for a bargain price! I've just been reading all the entries on Dear Photograph what am awesome website! I love all those Topshop dresses too!I have the second one in another colour and although i absoulutely love it i can't say that it was worth its £36 pound price tag.... seriously cheap and incredibly see through material! But i love it none the less! Adele was incredible at iTunes Festival, really desperate to see her live now! 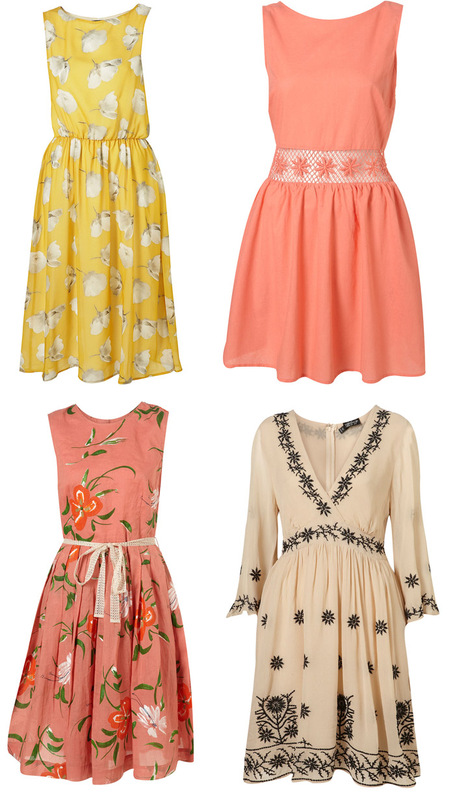 The coral dress is so pretty! I watched Adele's Someone Like you, and yup I also got a bit teary-eyed when everyone sang along. Those pink heels are SO cute. I'm not a heel-girl either but I can appreciate their fabulousness!